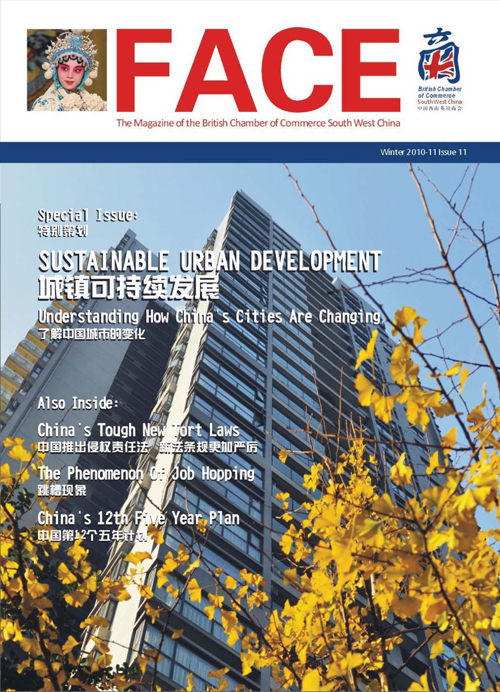 China is urbanizing at a time when world opinion regarding climate change means that those involved in city building cannot afford to ignore sustainable solutions to development. Fortunately, China is at a stage in its modernization where leaders have the ability to make decisions that will have far-reaching effects on the environment and quality of life in its cities. This presents a unique opportunity for China to create a new paradigm for efficient cities in the 21st century. China receives its share of criticism from the international press about the environmental quality of its cities. Yet while criticism certainly has its place, it is important to keep in mind that the cities in the developed world which went from pre-industrial communities to manufacturing centers and ultimately post-industrial metropolises did not get there overnight. One needs only to recall James Joyce’s Dublin or Charles Dickens’ London to bring to mind the growing pains that cities in the industrialized West went through during their own evolution. China is following the same urbanization pattern seen in the West, yet at what the late British geographer David Drakakis-Smith called ‘a speed unprecedented in human history’. Drakakis-Smith also noted that China added more city-dwellers in the 1980s than did all of Europe in the entire nineteenth century! And there is still a long way to go. It is projected that by 2015, the rural and urban populations of China will each stand at 50%. By 2025, the urban population is set to make up 75% of China’s total population. Thus, the future success of China depends largely on how well the country’s cities sustain economic growth and absorb the continuing influx of rural migrants. So far, China has done a good job of transitioning relatively smoothly from a rural to urban nation. Not only have China’s urban areas grown economically and expanded physically, they are also striving to meet highly functional levels of sustainability. Lisa Hoffman, Professor of Urban Studies at the University of Washington in Tacoma, attributes this in large part to the openness of China’s leaders to learning from what she refers to as ‘proven models sustainable urban practices’. That is, as she clarifies, municipal officials in China will often visit sites and invite planners, politicians, technicians and businesses to teach them how to be ‘green’. In practice, this means that rather than setting guidelines arbitrarily for land use planning (also known as ‘zoning’), municipal leaders are open to hearing from architects and urban planners before coming to a decision about what should be built and where. Recommendations are typically manifested in what are known as ‘master plans’ or ‘design studies’ of large swaths of a city. This flexibility in zoning means that China’s cities are adaptable to emerging international urban planning trends. Most of these trends are guided by an earnest desire to create cities that are high in density, walkable and served by efficient public transportation. Other, albeit less glamorous aims include effective waste management, crime reduction and the ‘greening’ or beautification of important streets. In Chengdu, guided by the Garden City concept, the local government has successfully initiated two street beautification projects – on Binjiang Lu along the river that flows through the city’s downtown area, and Renmin Nan Lu, a primary north-south boulevard that bisects the city. In both cases, efforts were taken to update building facades, plant trees, and design lighting schemes that enliven the night-time atmosphere of the streets. As in Chengdu, underground subway systems are being built in nearly every large Chinese city in anticipation of continued urbanization. High population density means that mixed-use projects around subway transit hubs have a high probability of becoming lively urban spaces in the future. Mixed-use developments are tightly packed projects that feature a mixture of retail, commercial office, hotel and residential uses. In order to reach high densities, most new mixed-use projects consist of high-rise buildings rising out of lower retail ‘podiums’. Many of these projects are being built not in city centers, but in outlying districts on previously undeveloped land. Today, the construction sites outside the 3rd or 4th ring roads of many Chinese cities might not look like much, and may even look like physical signs of an impending real estate bubble bust, but in fact what is happening is smart urban planning for the future. Transport links such as new roads and subway lines make this kind of expanding growth possible. China’s cities are following a similar process as cities in the developed world. Many of the largest cities have already seen their heavy industry move outside of central areas. As China’s economy continues to grow and wages inevitably increase, manufacturing will eventually move to other developing countries. At this point, it will be up to China’s leaders to shift the economy from one largely based on heavy industry to a post-industrial economy focused more on knowledge-work and creating new technologies. By the time this happens, China will be thankful that it invested so much into building its infrastructure and developing its cities to accommodate unprecedented urban growth. In the future, it is highly likely that China’s cities will no longer be following other models, but rather be the new standard by which cities in the developing world shape themselves. Adam Nathaniel Mayer is a Project Designer at Cendes Architecture in their Chengdu office.